Community journalists in Maryland – reporters who slog through school board meetings and profile high school athletes-of-the-week – were already discussing unionizing when a shooter turned one of their newsrooms into a deadly crime scene last June. The workplace death of five Annapolis Capital staffers only paused an organizing effort involving not only the Capital Gazette Newspapers, but journalists at the Carroll County Times and the Baltimore Sun Media Group (BSMG) as well. “We kind of took a step back. People need to heal,” said Libby Solomon, a reporter for one of the BSMG publications, the Towson Times. Eventually organizing resumed. And yesterday a letter went out to the group’s corporate overlord – Tribune Publishing (known briefly as “tronc”) – asking for voluntary recognition of the Chesapeake News Guild, a project of the Washington-Baltimore News Guild. If Tribune Publishing does not respond within 72 hours, the next step is to file for an election. 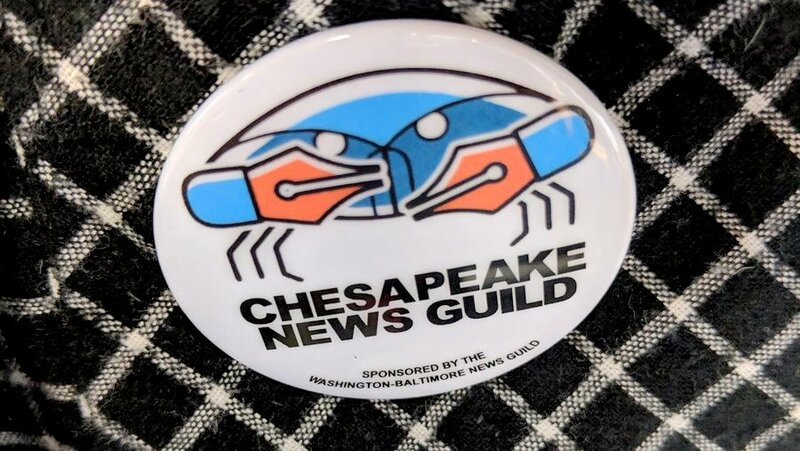 Organizers say the Chesapeake News Guild would include about 50 reporters, copy editors, photographers and designers covering news in five counties comprising more than 2.1 million people. “A majority of those journalists have signed authorization cards, with the hopes of banding together and preventing their communities from becoming news deserts,” a statement from the group says. Underlying the union effort is the collapse of local news coverage in recent years. The Capital serving Annapolis and Anne Arundel County, the Towson Times, the Catonsville Times, the Carroll County Times, The Aegis serving Harford County, the Howard County Times, the Bowie-Blade News, The Crofton-West County Gazette, and one of the oldest newspapers in the U.S., the Maryland Gazette. Acquired between 2012 and 2014 by the Baltimore Sun, the papers constitute the Baltimore Sun Media Group. Although the Sun owns them, their employees are not a part of its union. The Sun once maintained a network of suburban bureaus staffed with union-member employees who competed with these papers. But those bureaus were shrunk and shut down as the company gobbled up the competition. “They have, in effect, replaced The Sun’s shuttered suburban bureaus, but do not enjoy the same pay, benefits or protections as Sun staff. It’s time for that to change,” said reporter Scott Dance, chair of The Sun’s bargaining unit on Twitter. The Sun bureaus were shrunk and eventually shut down, as the company gobbled up the competition. “Personally, I just want to share how impressed I am by their bravery and initiative,” Dance added, noting that reporters approached him with questions about unionizing last winter. For academics and TV pundits, the collapse of local news is the subject of op-eds and white papers. For Solomon, the lone reporter for the Towson Times, it’s her average day on the job. The main motivation for organizers is a desire to keep their newsrooms going and ensure that local journalism continues to serve communities. Working full-time on a salary which, like those of her BSMG colleagues, falls into the $30,000-$35,000 range, the 24-year-old Solomon sees a grim future. The turnover rate is high because starting salaries are so low and there’s no guarantee of raises. “There are people who have been working here for years and years and years, and they make about the same amount of money as someone just starting out at 22 or 23,” she said. Another complaint is the institutional wall between community reporters and Guild-covered Sun reporters. That separation makes for isolation and unwieldy four-way conversations. When BSMG reporters need to talk with Sun reporters to pass along a news tip or ask for help they must communicate through each reporter’s editor. “If I need a county council member’s phone number, I’m supposed to ask my editor to ask their editor to ask them for it,” said Cody Boteler, 23, a BSMG reporter covering southwest Baltimore County. The communication ban is also a lost opportunity for younger reporters to learn from older veterans. “We have no way to interact with them – we’re not allowed to,” Solomon said. Last to Leave, Turn out the Light? 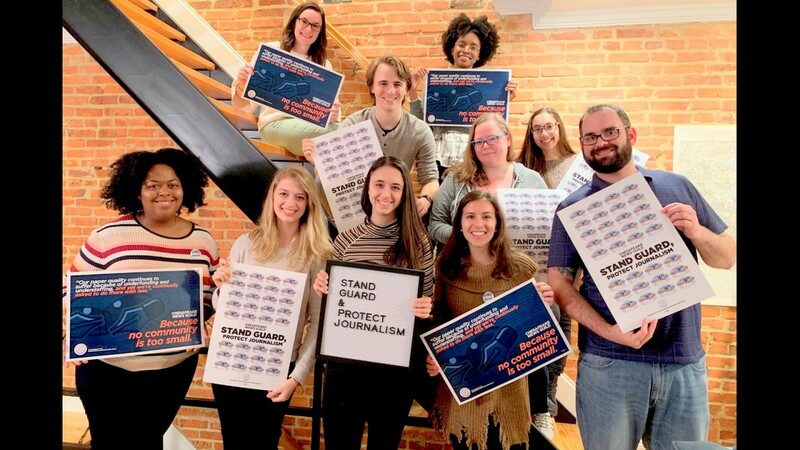 While low pay and lack of union protection are a major concern, Solomon and her fellow Chesapeake News Guild organizers say their main reason for coming together is the desire to keep their newsrooms going.